Bachmann Industries is a Bermuda registered company that is based in Hong Kong, with its founding base and North American headquarters located in Philadelphia, Pennsylvania specializing in model railroading. Bachmann's fully owned plant is located in Dongguan, China. The plant is a joint venture with the Chinese Government. The original company was started in America in 1833 by Henry Carlisle. He was a manufacturer of products made from horn, ivory and tortoise shell. A large part of this business in that era was the manufacture of high-back Spanish combs for the ladies of the Southern States. After the American Civil War this business was lost. The manufacture of side combs, dressing combs, barettes, and other hair ornaments was continued on a large scale from both horn and tortoise shell. Hand carved ivory umbrella handles were also made at that time. In 1899, Carlisle decided to merge the company with another similar business being run by Henry G. Bachmann, a German immigrant and his son, Walter J. Bachmann. Adapting to changing times, in 1912 the company began using a new material, celluloid, to manufacture eyeglass frames. After Henry G. Bachmann's death in 1914, the company changed its name to Bachmann Brothers. In 1929, Bachmann Brothers moved to more spacious headquarters at 1400 East Erie Avenue, Philadelphia, where it remains to this day. It continued to specialize in injection molding and was the first American company to manufacture prescription sunglasses. During World War II, the company manufactured products to support the war effort including sunglasses for U.S. Army and U.S. Army Air Force personnel along with protective eye devices and submarine battery caps. The growing company came under the control of J.C. and B.H. Crowther, nephews of the Bachmanns. To extend its market outside of glasses, combs and brushes, in 1947 Bachmann made a miniature plastic fence that was originally designed as a decoration to be placed under Christmas trees. However, this item would soon completely change the direction of the company. It was discovered that people were using this Christmas tree decoration item for fences on model train layouts. Bachmann began to remarket the "fence" under the brand name 'Plasticville® U.S.A.' It was so successful that the brand moved full scale into producing a complete line of easy-to-use snap-together plastic molded miniature buildings, scenery, and accessory kits for model train layouts. Bachmann did not become important to tinplate and model Railroaders until the 1950's when they mass produced this large line of injection molded plastic buildings. They even applied for and received a patent for the design of the snap together parts. The buildings are roughly 'O' Scale but also looked good with 'S' gauge. As accessories to Lionel and American Flyer trains, the Bachmann Plasticville® brand experienced substantial growth. In the late 1950's Lionel actually licensed the products and packaged them in their own famous orange boxes. The Plasticville® kit molds were also half-sized in the 1960's in order to produce HO scale versions. Most of the original kits in both sizes are still produced. There are hobbyists who specialize in collecting Plasticville® kits. Determining it had established enough brand name recognition with the success of its scenery and accessory products, Bachmann moved into producing actual working engines and rolling stock in a variety of scales. They turned to Kader Industrial, Ltd. for manufacturing support. Founded in 1948 in Hong Kong, Kader was established to produce models and toys for export. In 1952 Kader made the first Model Trains for Bachmann‘s American market. Primarily working in 'O' scale (1/48th size) and HO (1/87th size) scale, they steadily worked into other scales. Bachmann entered the 'G' Gauge market starting with battery operated trains and moved up to track current driven trains. They became the leader in the low price range of the 'G' market. Bachmann continued to diversify in the '60s and '70s, including among its many ventures slot cars, toy airplanes, plastic animal sets, robots, and cassette cases. As model railroading became more popular, the company supplied everything from trains to scenery to whole villages. Bachmann Bros. entered the N scale market in 1968. The items were made in Bachmann's Hong Kong factory. Early models included an oversized F9A and GP40. The Budd Metroliner was one of the models offered in 1969. A Northern 4-8-4 steam engine also came out in N in 1969. Scale locos and rolling stock in HO gauge were first introduced in the 1970's. Bachmann released its HO gauge version of the F9A in six different roadnames in 1970. Released in 1972, the Saddle Tank was the first HO scale steam engine offering. In 1974 Bachmann added the U36B diesels to its HO product line. U33B's were first cataloged in 1976. In 1978 Bachmann introduced its F40PH diesel in a couple of variations - red-nose Amtrak Phase I and a Phase II scheme with red and blue bands. A variation on Bachmann's General Electric U36B tooling, the BQ23-7 was a 1981 addition to the HO-scale diesel roster. Two roadnames, Chessie and Family Lines (SCL/L&N), were offered. Other notable items that Bachmann made were the United Aircraft Turbo-Train and the Auto-Train. In the 1980's, Bachmann introduced the TGV Train, Brill and PCC streetcars, EMD DDA40X, EMD SD40-2, GE 35 Ton Switcher, and an EMD GP50. They also added several steam locomotives to their line, including a Consolidation 2-8-0, a N&W J 4-8-4, a NYC Niagra 4-8-4, a Santa Fe Northern 4-8-4, and a GS4 4-8-4. The Kader relationship developed and prospered until 1984, when Kader acquired the Bachmann Company in its entirety. Bachmann introduced its premium Spectrum® line in 1988, which emphasized highly detailed, faithfully reproduced locomotives and train sets. The Kader Company also produced Model Railway equipment for other model brands. Most notably, a GP30 diesel which was part of Lionel's second venture into the HO scale train market from 1974 until 1977. Kader also sold GP30 shells to Bev-Bel and Front Range in the 1980's through the 1990's. Bachmann Industries (Europe) was set up in England during 1989. It‘s initial product range, called Branchline, consisted of molds used to produce the Mainline range of Railway models. The Kader Group produced model trains for the whole world; being accredited with ISO 9001 certification in 1999 as recognition to the high quality of its products and services. It employed up to 18000 workers and annually produced over 1.3 million train sets for the U.S market alone. In 1990, Bachmann created the Big Haulers™ line in Large Scale. In 1992 Bachmann Industries (Europe) purchased the continental manufacturer Liliput and a German sales office was established, to handle all marketing, sales and product development for the Liliput brand. Liliput trains had been made in Austria for years, but production was moved to China after the Bachmann acquisition. The start of the new millennium heralded yet more acquisitions and growth for the Bachmann group of companies. 2000 saw the British 'N' scale manufacturer Graham Farish purchased by Bachmann Europe plc. This range of models has also had its production transferred to the Kader factory, joining both Branchline and Liliput. The company became the distributor of Thomas & Friends™ in the United States in 2002, and delivered these locomotives, train sets, and accessories to aspiring engineers in both HO and Large Scale. The Bachmann brand is the largest seller, in terms of volume, of model trains in the world. Bachmann continued to specialize in inexpensive high quality entry-level train sets sold in the mass market, while at the same time, it expanded into manufacturing high quality products for the hobbyist as well. The turnover for Bachmann model trains for the year ended December 31, 2006 was approximately $46.87 million, a slight increase of 3.36% as compared to 2005. In October 2007 Bachmann acquired Williams Trains, thus adding a three rail 'O' gauge product line to their portfolio. They promoted the Williams name as "Williams by Bachmann" to capitalize on both brand names. 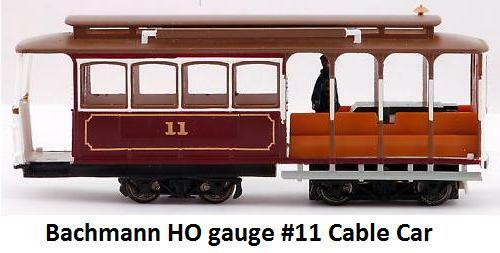 Bachmann is the only model train company to offer HO, N, O, and G scale product lines. In late 2008 Kader acquired Sanda Kan Industrial Company Limited (Sanda Kan) for US$8.5m. The acquisition created strategic synergies between the two companies, making more resources and facilities available, and also providing clients with a solid financial backbone. Sanda Kan alone occupied a total floor space of 1,200,000 square feet, and employed around 8,000 staff including more than 400 toolmakers and over 300 designers, product and production engineers. Established in 1973, Sanda Kan was a highly recognized developer and manufacturer of precision models in Hong Kong. It produced a full range of model train locomotives, from the very small 1:220 scale to the large 1:22 scale products. Other hobby items included electronic slot racing cars, sophisticated digital controls as well as accessories such as scenery, promotional cars and trucks. Sanda Kan worked closely with some of the world’s leading brands from concept to mold construction through to final production. Sanda Kan's biggest client had been Bachmann's dominant rival in the UK market Hornby Railways, which had concentrated production there since 1997-2001. Other manufacturers included the likes of Weaver, S Helper Service, Life-Like, Brawa, American Models, Bowser, Micro-Trains, Aristo-Craft, Wm. K. Walthers, Atlas and Märklin/Trix. Sanda Kan also owned American 'O' scale K-Line Trains and licensed the K-Line train line to Lionel. As a result of this acquisition, Sanda Kan announced that it was going to stop supplying trains to several of its US and European train manufacturers. Between 1996 and 2009, Kader’s products won more than 30 'Model of the Year', 'Manufacturer of the Year' and many other awards sponsored by Model Railroader, BahnProfil, Eisenbahn and other various magazines and industry organizations. Link to Bachmann Industries Web Site.